Two of my friends and I got bored so we decided to figure out who really is the best fighter of in the universe of Game of Thrones. 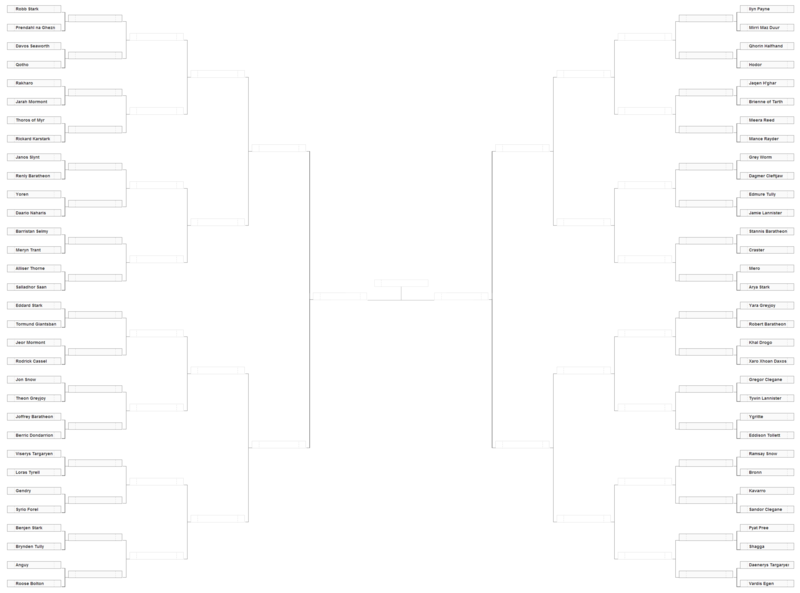 We took the 64 best fighters from Essos to Westeros and put them in a random bracket and matched them up against each other in a single elimination tournament until we had a 1st, 2nd, and 3rd places. True in hindsight a double elimination would have been a better, it would have eliminated a few early exits. But hey this is good enough. This is “Game of Thrones” not A Song of Ice and Fire. It is also only seasons 1-3 of Game of Thrones so if they don’t appear before this season they don’t qualify. All characters will be at “best form” throughout the three seasons (e.g. : Jamie with both hands). Also all characters will get any equipment or animals they need to be at “best form” meaning Robb and Jon get their wolves and Khal gets his horse, also Barristan and others have their armor, and so on. Of course. You’ve got Grayson who has read all five books and seen every episode of Game of Thrones, a few times actually. Alex who has seen all three season and read all the books. And myself who has seen every episode countless times and since I read behind the shows as to avoid spoil city, I have read books 1 and 2.